Today I enjoyed snow/sew day #2, then threw together a last-minute dinner that ended up being awesome! Talk about a good day! I didn’t measure anything, just kind of tossed stuff together. Here is what went down. 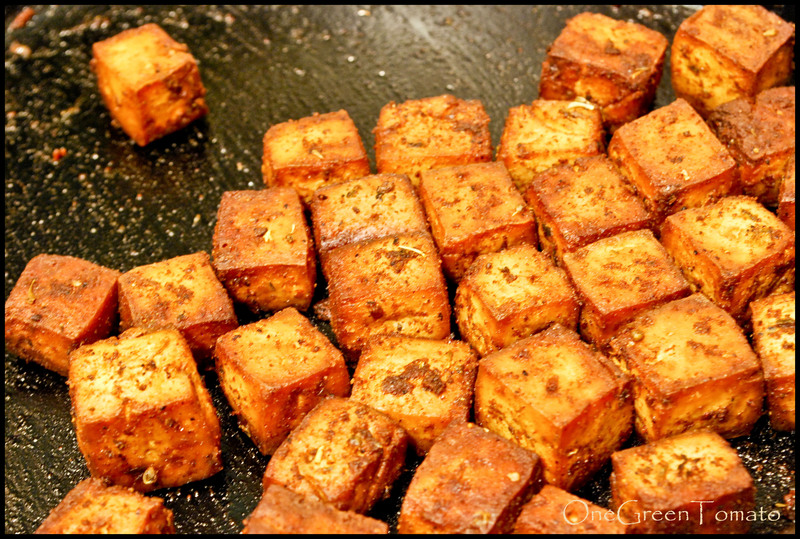 Drain and slice tofu into 4 sections. Press about 30 minutes. I usually place mine between two kitchen towels, then set a wooden cutting board and cast iron cookware on top. 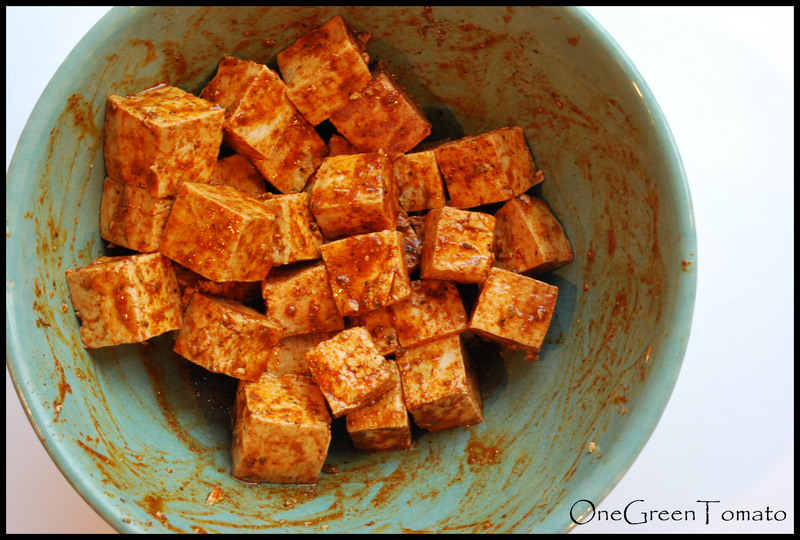 While your tofu is pressing mix the above ingredients in a medium bowl. Cube tofu and place in bowl, coat well. Set the bowl in your fridge and remix every 30 minutes or so. I did this for about 2 hours. Preheat oven to 300 degrees. 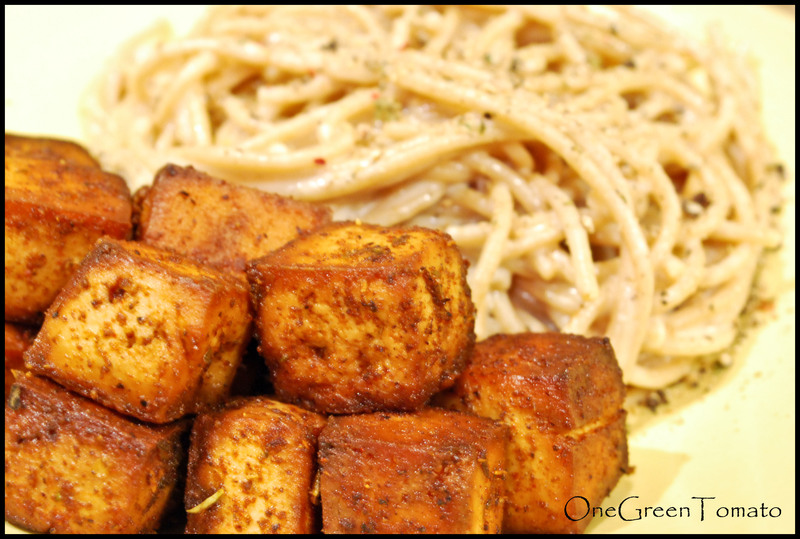 Place marinated tofu in a greased 9×13 pan. (I used my cast iron skillet) Bake for about 60-70 minutes stirring every 20 minutes or so. While the tofu was baking I placed a small sauce pan on the stove and melted a good amount of butter over low-med heat. Then added some garlic and onion powder, turned the heat up slightly and simmered for several minutes. I then added approximately 1 cup 1/2 & 1/2 and grated a good amount of parmesan cheese into the pan. Be sure to whisk your sauce constantly so it does not burn. Once the cheese has melted and sauce thickens, maybe 3-5 minutes, add your cooked pasta and stir to coat. This makes enough sauce for 2 small servings.